There are approximately 40 species of snakes in Alabama, and only six of these are poisonous. However, most people don’t want to get anywhere near close enough to a snake to determine whether it’s dangerous or not. Snakes are by far some of the most feared and loathed wild animals on the planet. But truth is, aside from the poisonous ones, snakes actually are very good to have around. Many of them eat rodents and other nuisance animals, while others eat insects. As appealing as that might sound, one of the main problems is once a snake sets up residence around your home, it will reproduce. And while having one or two harmless snakes roaming your property might be tolerable, having hundreds of them most certainly is not. If you have seen a snake around your home — or found a snakeskin in your attic — it is probably a harmless rat snake. Also, just to put your mind at ease, if you see a snake climbing or in a tree, it is most likely a harmless animal as well. All the poisonous snakes in Alabama are in the pit viper group, and they typically have heavy bodies and remain on the ground. Again, you likely don’t want to get close enough to any snake to be able to identify it, but in the unfortunate event you find yourself in close proximity, note that the pit vipers all have flat, triangular heads with a pit near their nostril, and vertical pupils. The majority of snakes in Alabama, the non-poisonous ones, have elongated oval heads, no pit, and round pupils. Remember that snakes are cold-blooded and their body temperature is dependent on external conditions. During hot periods, they will seek shade in cool, moist areas, and when it is cooler, they will try to locate themselves in sunny areas. When it is extremely cold, they are not active at all. You can discourage snakes around your home by keeping woodpiles off the ground (snakes love woodpiles), keeping brush and debris cleared, and controlling the rodent population. 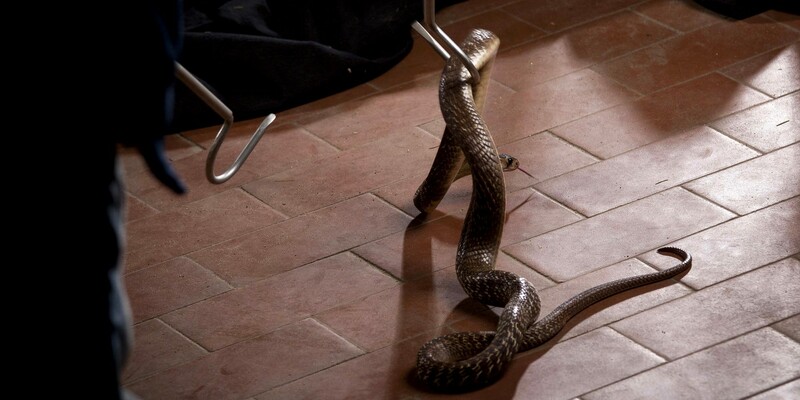 However, if you do find a snake in or around your home, it’s better to be safe than sorry. Do not try to remove the snake yourself, contact licensed wildlife professional Scott Lang for fast, humane removal of unwelcome reptiles and other nuisance wildlife.